Will anyone tell the truth about climate change? In the Kubler-Ross stages of grief, it is a long road from denial to acceptance. But in the tragedy that is climate change, the terrifying new math proves that we need to get to acceptance as quickly as possible in order to prevent -- or at least minimize -- a planetary cataclysm. Doing that, as I argue in this short new video, requires a massive public education campaign about the reality of climate change, starting with the mass media. But one of the big problems is local television news -- and how so many of the nation's Ron Burgundys are full-on climate-change denialists. Also important is the quiet change happening in the national media -- a change whereby more and more outlets are taking steps to diminish -- or criticize -- what minimal climate change coverage still exists. The New York Times announced that it is disbanding its Environment Desk and wholly eliminating the environment editor and deputy environment editor. 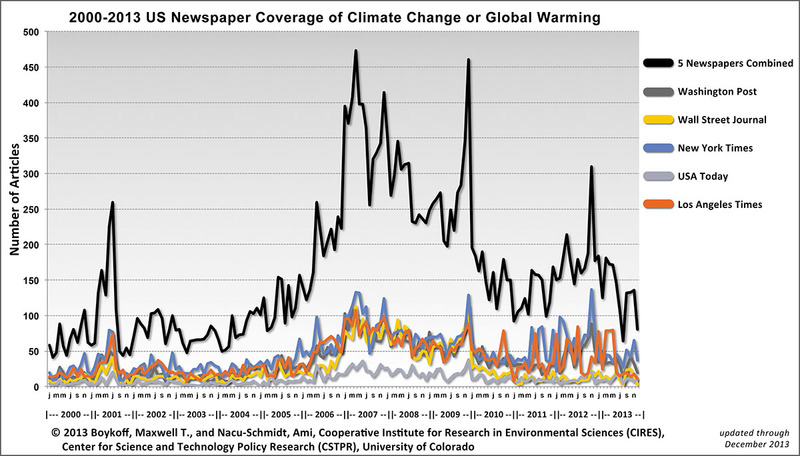 The news is particularly important, considering the fact that out of all major national newspapers, the Times had published the most stories about climate change in 2012. Despite journalist Bill McKibben correctly noting that climate change is "not just the biggest crisis ever (but) the biggest story ever," Inside Climate News reports that the nation's five largest-circulation newspapers will only "have about a dozen reporters and a handful of editors among them whose primary responsibility is to cover the environment." Citing stats from the Daily Climate, the Huffington Post reports that "as the country experienced its warmest year on record, coverage of climate change on major U.S. television networks and across media outlets dropped in 2012." In all, "Worldwide climate coverage decreased by two percent between 2011 and 2012 ... marking the fewest number of published stories since 2009." The Columbia Journalism Review reports that there are now just 19 weekly science sections left in American newspapers. That's down from 95 two decades ago. Fox News host Jon Scott took to the airwaves to insist that climate change is not one of "the really pressing issues of our time." The declaration came just after Fox's owner, Rupert Murdoch, began dabbling in climate change denialism and suggesting that climate change is not a crisis. In response, the Free Press' Tim Karr put it best, saying it is horrifying that a "global warming denier also runs one of the largest news businesses in the world." I've said it before and I'll say it again -- in a country where the filibuster gives 11 percent of the population effective veto power over national legislation, addressing climate change requires true national consensus that the situation is an emergency. Getting to that consensus requires a media that at least covers the issue in a serious way. Unfortunately, that's not happening now, and worse, the prospective trends are clearly not encouraging.